HTML5 video and Flash are not supported by this browser. 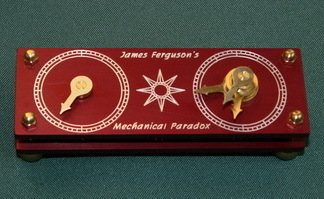 We're pleased to make this available to people wishing to enhance their presentation of Ferguson's great invention. The gears A, B, and bottom C that drive the Earth's axis have 39 teeth. The middle C gear that drives the Nodes of the Moon's orbit has 37 teeth, and the top C gear that drives the apogee pointer has 44 teeth. When first manufactured, Armstrong Metalcrafts aligns all the pointers to point to the left. The first revolution of the knob shows the differential motion of the gears very clearly. As the knob is rotated through further rotations, the difference in pointer positions will appear to grow and shrink. One might be tempted to think the pointers will soon return to their initial position, but it actually requires 1628 turns. This is because 37 is a prime number, so there must be 37 times 44 turns before the pointers return back to their initial position. Armstrong Metalcrafts is building a limited number of these for sale. The retail price is $295, and this includes a small booklet explaining the history of the mechanical paradox and how it works. To inquire about a purchase, please use our contact form or send an email to "sales" at armstrongmetalcrafts.com.